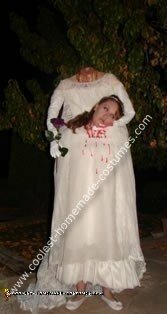 This Headless Bride Costume is the coolest costume ever. The body was created out of paper mache. I used my niece as a model. I paper mached her shoulders. I let it dry for several days. It was then painted flesh color and attached to a backpack for me to wear. I bought the wedding dress at the Salvation Army and it fit perfectly. The arms were made from chicken wire and attached them to the body with screws. I put white cloves as hands. I cut a hole in the dress where the stomach is supposed to be so that I could put my head through. A little fake blood, an accessory like a flower and bam a great Halloween costume. I actually got several ideas from this website and combined them. It also works out great that I am kind of short so the body area is relatively the same height as someone who would be around 5ft. 7in.